If you want some royal treatment for your EML file data, then users this is only possible when your use Atom TechSoft EML to MSG Converter software, which perfectly convert EML file data into MSG file with full efficiency. All software of Atom TechSoft made by simple and easy procedure by which all users easily handle this application without knowing any type of technical knowledge and MSG to EML Conversion tool is one of the part of this software. 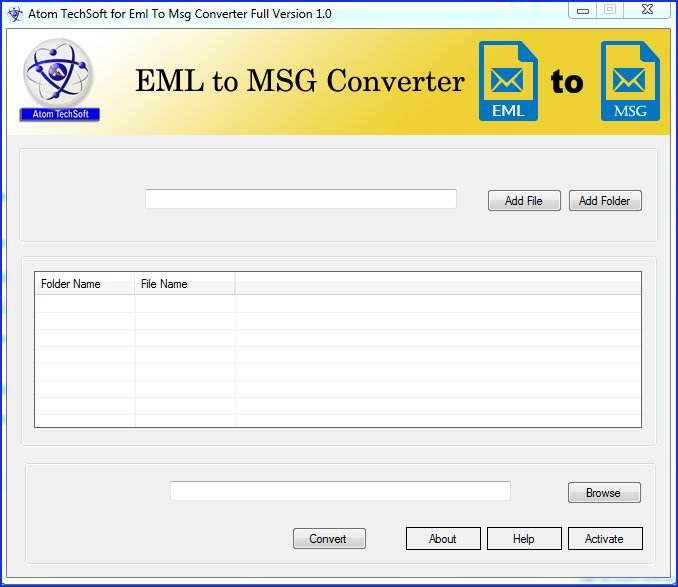 Free EML to MSG Converter software convert unlimited emails or messages without any type of boundation and it also support .eml clients like:- Outlook Express, Windows Live Mail, Mozilla thunderbird, outlook express and etc. The software gives advance type of majestically treatment to extract data from EML file and convert/export EML file to MSG file with emails attachment properties: - to, bcc, cc, time, subjects and from, embedded images etc. One and most selling feature of this software is that you can filter all the emails by recover skip emails and messages from two dates (“start date” to “end date”) without harm interior database and users one more happy news for all users is that no need of MS Outlook installation will be needed to run this application and you can run this application without facing any type of barrier. If you want to take its free trial version to know the efficiency and working speed of this eml to msg conversion software then use its free demo feature and recover 5 emails and messages within free of cost no single dollar will be charge on using of this feature but if you want to recover unlimited emails of EML file then purchase its full version within in reasonable price. Disk Defrag will speed up your computer by optimizing file system. It can defragment files, consolidate free space and move system files to the faster part of the disk. With Disk Defrag you`ll get the maximum out of your hard drive performance. Kernel for NTFS is exclusively designed NTFS data recovery software that recovers files and folders from formatted and reformatted Windows NTFS partitions. freeCommander is a dual-panel file explorer with many additional features. Pathbuddy gives you quick access to frequently used folders. Easily change to predefined folders in the Windows file Explorer and in 'Open' & 'Save' dialogs with hotkeys or thru a browseable list.